BROOKVILLE. Off a long, private road winding through pristine woodland, this magnificent Georgian-style brick colonial welcomes visitors with a front courtyard and impressive, arched front portico. Secluded on approximately 2 scenic acres of gently rolling lawns accented by flowering shrubs and towering trees, it enjoys access to horse trails in its wooded surroundings. Built in the Twenty-First Century with all the lavish amenities so sought after today, its exquisite craftsmanship and high-end materials pay homage to the grand estates of the early Twentieth Century, known as Long Island’s “Golden Age.” The gentle rolling and wooded hillsides of Brookville are dotted with beautiful properties. Their residents enjoy a great location, convenient to boating, golf, equestrian facilities, quaint village shopping, museums, the award winning Jericho School District, and Long Island Railroad putting them within a comfortable commute to Manhattan. The 2-story, center-hall entrance foyer is a stunning introduction to this elegant and luxurious home with tall entry doors set in an arched wall of windows; incredible inlaid marble floors; massive boiserie-accented moldings; and a graceful floating staircase. The formal dining and living room, with fireplace, are perfectly attired for gracious entertaining, as is the expansive great room, with fireplace, that overlooks the generous rear bluestone patio through 2 sets of French triple-doors. With brick sitting wall, the raised patio includes a built-in gas grill, ideal for al fresco dining. Adjoining the great room through French doors, the huge French country kitchen provides a fabulous work area, with Center Island, Viking 5-burner gas cooktop, Bosch dishwasher, 2 Thermador ovens, and stainless steel refrigerator. It opens to a sunny breakfast room with bay window, French door to the patio and a butler’s pantry. With access to the great room, the bright and cheery library features a stone corner fireplace and extra wide crown molding. A lovely powder room off the foyer, maid’s quarters and butler’s stairs off the s ide hall, complete the main floor. In its own wing off the 2nd floor foyer, the palatial master suite offers the romance and opulence of Empire interior design. The expansive master bedroom is separated only by Tuscan columns from a regal sitting room with marble fireplace. A lavish marble master bath continues the Empire décor with striking inlaid marble floor medallion and ornate ball-and-claw twin vanities matching a ball-and-claw tub. Four additional luxurious bedrooms with equally attractive baths en suite complete this level. A full basement includes a ground-floor entrance to the service courtyard separating attached double-car and single-car garages. High ceilings and ample floor space allow for future expansion. 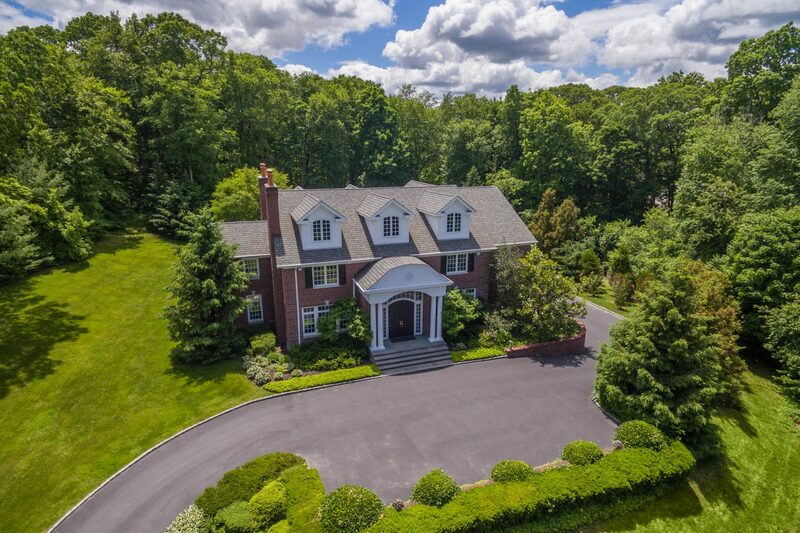 From its splendid and serene grounds with wooded vistas, to its finely detailed and masterfully appointed interior, this exceptional home provides the perfect retreat from daily cares. It creates the ideal venue or cordial entertaining in a sophisticated yet comfortable setting. For more information on this pristine Colonial in Brookville, click here.